2 Department of Radiological Sciences, Oncology and Pathology, Policlinico Umberto I, Univ. Sapienza, Rome, Italy. 3 Unit of Internistic Ultrasound, Dpt of Medicine and Science of Aging, "G. d'Annunzio" University, Chieti, Italy. In the last 12 – 18 months nearly all ultrasound manufacturers have arrived to implement ultrasound shear wave elastography modality in their equipment for the assessment of chronic liver disease; the few remaining players are expected to follow in 2016. When all manufacturers rush to a new technology at the same time, it is evident that the clinical demand for this information is of utmost value. Around 1990, there was similar demand for color Doppler ultrasound; high demand for contrast-enhanced ultrasonography was evident at the beginning of this century, and around 2010 demand increased for strain elastography. However, some issues regarding the new shear wave ultrasound technologies must be noted to avoid misuse of the resulting information for clinical decisions. As new articles are expected to appear in 2016 reporting the findings of the new technologies from various companies, we felt that the beginning of this year was the right time to present an appraisal of these issues. We likewise expect that in the meantime EFSUMB will release a new update of the existing guidelines  . The first ultrasound elastography method became available 13 years ago in the form of transient elastography with Fibroscan® . It was the first technique providing non-invasive quantitive information about the stiffness of the liver and hence regarding the amount of fibrosis in chronic liver disease . The innovation was enormous, since a non-invasive modality was finally available to provide findings otherwise achievable only by liver biopsy. In fact, prior to ultrasound elastography, a combination of conventional and Doppler ultrasound parameters were utilized to inform the physician about the presence of cirrhosis and portal hypertension . However, skilled operators were required, reproducibility and diagnostic accuracy were suboptimal, and it was not possible to differentiate the pre-cirrhotic stages of fibrosis. All these limitations were substantially improved by transient elastography, performed with Fibroscan®, a technology dedicated exclusively to liver elastography. Since then, more than 1300 articles dealing with transient elastography have been listed in PubMed, some describing results with more than 10,000 patients . The technique has been tested in nearly all liver disease etiologies, with histology as the reference standard. Meta-analysis of data, available in many etiologies , showed good performance and reproducibility as well as some situations limiting reliability . Thresholds for the different fibrosis stages (F0 to F4) have been provided by many large-scale studies utilizing histology as the reference standard . Transient elastography tracks the velocity of shear waves generated by the gentle hit of a piston on the skin, with the resulting compression wave traveling in the liver along its longitudinal axis. The measurement is made in a 4 cm long section of the liver, thus able to average slightly inhomogeneous fibrotic deposition. In 2008 a new modality became available, Acoustic Radiation Force Impulse (ARFI) quantification, and classified by EFSUMB  as point shear wave elastography (pSWE), since the speed of the shear wave (perpendicular to the longitudinal axis) is measured in a small region (a “point”, few millimeters) at a freely-choosen depth within 8 cm from the skin. This technology was the first to be implemented in a conventional ultrasound scanner by Siemens® . Several articles have been published regarding this technology, most with the best reference standards , some including findings on more than 1000 hepatitis C patients  or reporting meta-analysis of data . Although the correlation between Siemens pSWE and transient elastography appeared high  , the calculated thresholds for the different fibrosis stages and the stiffness ranges between the two techniques are not superimposable. Interestingly, pSWE appears to provide greater applicability than transient elastography for measuring both liver  and spleen stiffness, which is a new application of elastography , of interest for the prediction of the degree of portal hypertension  . Nowadays other companies have started producing equipment with pSWE technology, but only very few articles have been published so far, for instance describing the use of Philips® equipment, which was the second to provide pSWE. These articles show preliminary good results also in comparison with TE  . Not enough evidence is currently available in the literature about the elastographic performance of the products most recently introduced to the market. Furthermore, with some products the shear wave velocities generated by a single ultrasound acoustic push pulse can be measured in a bidimensional area (a box in the range of 2 – 3 cm per side) rather than in a single small point, producing a so-called bidimensional 2D-SWE . The stiffness is depicted in color within the area and refreshing of the measurement occurs every 1 – 2 seconds. Once the best image is acquired, the operator chooses a Region Of Interest (ROI) within the color box, where the mean stiffness is then calculated. 2D-SWE can be performed as a “one shot” technique or as a semi-“real-time” technique for a few seconds (at about 1 frame per second) in order to obtain a stable elastogram. With either technique, there should be no motion/breathing during image acquisition. A bidimensional averaged area should overcome the limitation of pSWE to inadvertently investigate small regions of greater or lesser stiffness than average. A shear wave quality indicator could be useful to provide real-time feedback and optimize placement of the sampling ROIs, a technology recently presented by Toshiba®, but which is still awaiting validation in the literature. Supersonic Imagine by Aixplorer® which works with a different modality of insonation and video analysis compared to the the previously-mentioned three techniques (i. e., transient elastography, pSWE and 2D-SWE), leading to a bidimensional assessment of liver stiffness in real time up to 5 Hz and in larger regions; thus this technique is also termed real-time 2 D SWE. It has been available on the market for a few years  , and many articles have been published showing stiffness values quite similar to those of Fibroscan® ; likewise, defined thresholds based on histological findings have appeared in several articles   . After this brief summary of the technological state of the art we would like to mention the following critical issues that we believe every user should note prior to providing liver stiffness reports. The thresholds obtained from the “oldest” techniques for the various fibrosis stages based on hundreds of patients with histology as reference standard cannot be straightforwardly applied to the new ultrasound elastography techniques, even if based on the same principle (e. g. pSWE). In fact, the different manufacturers apply proprietary patented calculation modes, which might result in slightly to moderately different values. It should be kept in mind that the range for intermediate fibrosis stages (F1 to F3) is quite narrow, in the order of 2 – 3 kilopascal (over a total range spanning 2 to 75 kPa with Fibroscan), so that slightly different differences in outputs could shift the assessment of patients from one stage to another. Comparative studies using phantoms and healthy volunteers, as well as patients, are eagerly awaited. In fact, the equipment might not produce linear correlations of measurements at different degrees of severity of fibrosis. As a theoretical example, some equipment might well correlate in their values with an older technique, such as transient elastography, at low levels of liver fibrosis, but not as well in cases of more advanced fibrosis or vice versa. Consequentely, when elastography data are included in a report, the equipment utilized for the measurement should be clearly specified, and conclusions about the fibrosis stage should be withheld if an insufficient number of comparative studies with solid reference standards are available for that specific equipment. Future studies using histology as a reference might be biased in comparison to previous studies, since nowadays fewer patients with chronic hepatitis C or hepatitis B undergo biopsy. In fact, due to wide availability of effective drugs as well as the use of established elastography methods for patients with viral hepatitis, most cases submitted to biopsy today have uncertain etiology or inconsistent and inconclusive clinical data. Therefore, extrapolated thresholds from such inhomogeneous populations applied to more ordinary patients with viral hepatitis might become problematic in the future, although no better solution is currently anticipated. This situation might lead to the adoption of a standard validated elastographic method as reference, but this has to be agreed-upon at an international level. Ultrasound elastography embedded in conventional scanners usually allows the choice of where to place the ROI within the color stiffness box and whether to confirm or exclude each single measurement when determining the final value. Thus, the operator has a greater potential to influence the final findings than with Fibroscan®, where these choices are not available. This has to be kept in mind to avoid the possibility that an operator could, even inadvertently, tend to confirm an assumption about that specific patient or to confirm the patient’s expectations. Quality criteria for the new technologies following transient elastography are absent (depending on the manufacturer) or have not been satisfactorily defined, so that the information potentially inserted in a report cannot currently be judged for its reliability by the clinician. Finally, factors affecting the final results and the rate of intra- and inter-operator reproducibility such as the level of transaminases, the degree of steatosis, the patient’s age, etc., have not yet been fully reported for many of the latest equipments, as opposed to the methods available for 5 or more years. Thus their real validity to define the progression or regression of fibrosis in chronic liver disease must still be proven. In conclusion, the technological progression of ultrasound methods in hepatology has been rapid and exciting. However, caution should be applied when describing the findings of the most recent shear wave ultrasound technologies and, even more importantly, more scientific evidence must be produced before their results are adopted to modify clinical choices, such as initiating ultrasound surveillance in chronic liver disease or screening for varices by endoscopy. This likewise applies to starting expensive antiviral treatments or predicting prognosis. Different technologies might not necessarily be mutually exclusive and whether the combination of multiple elastographic methods with the same patient might produce a more accurate assessment than a single optimal method appears worth to be investigated. Answering all the above mentioned critical issues will require solid single-center research, multicenter evaluations, new expert consensus and updated guidelines. In den letzten 12 bis 18 Monaten haben beinahe alle Ultraschallanbieter Scherwellen-Elastografie-Methoden in ihre Geräte integriert, um chronische Lebererkrankungen zu beurteilen. Die wenigen Letzten werden voraussichtlich 2016 folgen. Wenn alle Hersteller zur gleichen Zeit eine neue Technologie eilig einführen, dann ist es offensichtlich, dass der klinische Bedarf für diese Information von größtem Nutzen ist. Ähnlich verhielt es sich bei Einführung der die Farbdopplersonografie im Jahre 1990 sowie der kontrastverstärkten Sonografie zu Beginn der 2000er Jahre und der Strain-Elastografie um 2010. Allerdings müssen einige Aspekte in Bezug auf die neue Scherwellen-Ultraschallmethoden herausgestellt werden, um eine falsche Anwendung der Informationen in Bezug auf klinische Entscheidungen zu vermeiden. Da man 2016 neue Publikationen erwarten darf, die über die Ergebnisse der neuen Technologien verschiedener Hersteller berichten, sind wir der Ansicht, dass der Beginn dieses Jahres der richtige Zeitpunkt ist, eine Bewertung dieser Gesichtspunkte zu präsentieren, während die EFSUMB gerade an einer Neuauflage der früheren Leitlinien arbeitet  . Vor 13 Jahren kam die erste Ultraschall-Elastografie-Methode auf den Markt und zwar als transiente Elastografie mittels FibroScan® . Dies war die erste Technik, die in der Lage war nichtinvasive quantitative Informationen über die Lebersteifigkeit zu geben und somit auch eine Aussage über den Fibrosegrad bei chronischen Lebererkrankungen . Dies war eine enorme Innovation, da dadurch eine nichtinvasive Methode verfügbar war, die Befunde lieferte, die sonst nur durch eine Leberbiopsie erhoben werden konnten. Tatsächlich konnte vor Einführung der Ultraschall-Elastografie nur eine Kombination aus herkömmlichen Ultraschall- und Dopplersonografie-Parametern dem Arzt Auskunft über den Zustand einer Zirrhose und Pfortaderhochdruck geben . Dazu waren aber erfahrende Anwender erforderlich, die Reproduzierbarkeit und die diagnostische Treffsicherheit waren unzureichend und die Abgrenzung zu den präzirrhotischen Stadien einer Fibrose war nicht möglich. Alle diese Einschränkungen wurden wesentlich verbessert durch die transiente Elastografie mittels FibroScan®, einem Gerät ausschließlich für die Leberelastografie. Seitdem sind in PubMed mehr als 1300 Publikationen gelistet, die sich mit der transienten Elastografie beschäftigen, davon einige mit über 10 000 Patienten  und mit Einsatz bei Lebererkrankungen fast aller Ätiologien mit Histologie als Referenzstandard. Die Metaanalyse der verfügbaren Daten bei verschiedenen Ätiologien  zeigte gute Leistung und Reproduzierbarkeit aber auch begrenzte Verlässlichkeit bei bestimmten Konstellationen . Die Grenzwerte der verschiedenen Fibrosestadien (F0 bis F4) wurden durch viele große Studien mit Histologie als Referenzstandard erstellt . Die transiente Elastografie beobachtet die Geschwindigkeit der Scherwellen, die von einem definierten mechanischen Impuls des Transducers ausgelöst werden dessen Kompressionswelle in der Leber entlang der Längsachse verläuft. Die Messung erfolgt an einem 4 cm langen Leberstück, damit die leicht inhomogene fibrotische Schichtung gemittelt wird. Im Jahr 2008 stand mit der Acoustic Radiation Force Impulse (ARFI) eine neue Quantifizierungsmethode zur Verfügung, die von der EFSUMB  als Punkt-Scherwellen-Elastografie (pSWE) klassifiziert wurde, da die Geschwindigkeit der Scherwelle (senkrecht zu Längsachse) in einem kleinen Bereich („einem Punkt“, wenige Millimeter) in einer frei gewählten Tiefe bis zu 8 cm unter der Haut gemessen wurde. Diese Technik war die erste, die in einen konventionellen Ultraschallscanner von Siemens® integriert wurde . Es folgten zahlreiche Publikationen mit dieser Technik, viele davon mit besten Referenzstandards , einige schlossen Befunde von mehr als 1000 Hepatitis C Patienten ein  oder berichteten als Metaanalyse über diese Daten . Obwohl die Übereinstimmung der Siemens-pSWE und transienter Elastografie augenscheinlich hoch war  , waren die errechneten Grenzwerte für die verschiedenen Fibrosestadien und die Steifigkeitsbereiche beider Techniken nicht deckungsgleich. Interessanterweise schien die pSWE einen größeren Einsatzbereich als die transiente Elastografie zu haben, nicht nur bei den Leberanwendungen  sondern auch bei der Bestimmung der Milzsteifigkeit, ein neues Anwendungsgebiet der Elastografie , und sie ist von Interesse bei der Vorhersage des Ausmaßes eines Pfortaderhochdrucks  . Mittlerweile haben weitere Hersteller begonnen, in ihre Geräte mit pSWE-Technologie zu versehen, jedoch wurden bisher nur wenige Arbeiten publiziert z. B. mit Philips® Geräten, dem zweiten Anbieter von SWE, die erste gute Resultate im Vergleich zur TE zeigten  . Noch gibt es in der Literatur keine ausreichende Evidenz in Bezug auf die Leistung der Elastografie derjenigen Firmen, die zuletzt auf den Markt kamen. Darüber hinaus werden bei einigen Herstellern die Scherwellen-Geschwindigkeiten, die durch einen einzigen sonografisch akustischen Druckimpuls erzeugt werden, in einer Fläche mit 2 – 3 cm Seitenlänge statt in einem kleinen Punktbereich als sogenannte zweidimensionale 2D-SWE gemessen . Die Steifigkeit wird in diesem Bereich farblich dargestellt und eine Aktualisierung der Messung erfolgt alle 1 – 2 Sekunden. Sobald das beste Bild erzeugt wurde, wählt der Anwender eine „region of interest“ (ROI) innerhalb der Farbbox, in der die Steifigkeit errechnet wird. Die 2D-SWE kann als „Ein-Schuss“-Technik oder als Semi-Echtzeit-Technik für einige Sekunden (etwa 1 Frame pro Sekunde) durchgeführt werden, um ein stabiles Elastogramm zu erzielen. Bei allen Techniken ist zu beachten, dass der Messvorgang t von Bewegungsartefakten (Transducer, Patientenbewegungen, Atmung) frei bleibt. Gemittelte 2-dimensionale Werte können die Limitationen der pSWE aufheben, die darin bestehen, dass man irrtümlich kleine Bereiche mit größerer oder geringerer Steifigkeit als den Durchschnitt untersucht. Ein Scherwellen-Qualitätsindikator könnte nützlich sein, um ein Feedback in Echtzeit und die optimale Platzierung der untersuchten ROI zu gewährleisten. Diese Technologie wurde kürzlich von Toshiba® vorgestellt, wurde jedoch noch nicht in der Fachliteratur validiert. Der SuperSonic Imagine von Aixplorer®, der mit verschiedenen Modalitäten der Insonikation und Videoanalyse der zuvor genannten Techniken (transiente Elastografie, pSWE und 2D-SWE) arbeitet, führt zu einer zweidimensionalen Bewertung der Lebersteifheit in Echtzeit bis zu 5 Hz und in größeren Bereichen, deshalb wird diese Technik als Echtzeit 2 D SWE bezeichnet. Sie ist seit einigen Jahren auf dem Markt   und es wurden reichlich Arbeiten publiziert, die über ähnliche Steifigkeitswerte wie unter FibroScan berichten  und in mehreren Arbeiten wurden die Grenzwerte durch histologische Befunde definiert   . Nach dieser kurzen Zusammenfassung der technologischen Gesichtspunkte möchten wir die folgenden kritischen Aspekte herausstellen, die nach unserer Meinung jeder Anwender beachten sollte, bevor eine Bewertung der Lebersteifigkeit erfolgt. Die Grenzwerte, die aus den „ältesten“ Methoden für die verschiedenen Fibrosestadien auf Grundlage von Hunderten von Patienten mit der Histologie als Referenzstandard abgeleitet wurden, können nicht einfach auf die neuen sonografischen Elastografietechniken übertragen werden, selbst wenn diese auf dem gleichen Prinzip (z. B. SWE) beruhen. Tatsächlich besitzen die verschiedenen Hersteller eigens patentierte Berechnungsmethoden, die zu leicht bis moderat abweichenden Werten führen können. Es ist wichtig daran zu erinnern, dass der Bereich der verschiedenen intermediären Fibrosestadien (F1 bis F3) recht eng ist, im Bereich von 2 – 3 Kilo-Pascal (über einen Gesamtumfang der 2 bis 75 kPa umfasst), so dass geringfügig unterschiedliche Abweichungen der Outputs dazu führen, dass ein Patient von einem Stadium in das andere fällt. Vergleichsstudien nicht nur an Phantomen, sondern an gesunden Freiwilligen werden hier gespannt erwartet. Tatsächlich erzeugen die Geräte vermutlich keine linearen Korrelationen der Messungen bei den verschieden schweren Fibrosestadien. Um nur ein theoretisches Beispiel zu nennen, könnten bei einigen Geräte deren Werte bei einer geringgradigen Fibrose mit älteren Techniken, wie der transiente Elastografie, korrelieren, während dies bei fortgeschrittenerer Fibrose nicht der Fall ist und umgekehrt. Daraus folgt für den Einschluss von Elastografiedaten in einen Bericht, dass die für die Messungen benutzen Geräte klar spezifiziert werden sollten und dass keine Schlussfolgerungen über das Fibrosestadium gemacht werden, solange Vergleichsstudien mit soliden Referenzstandards für diese spezielle Geräteausstattung fehlen. Zukünftige Studien mit der Histologie als Referenzmethode können im Vergleich zu früheren Studien verzerrt sein (Bias), da heutzutage bei Patienten mit chronischer Hepatitis C oder Hepatitis B immer seltener eine Biopsie durchgeführt wird. Es ist vielmehr so, dass aufgrund der großen Verfügbarkeit effektiver Medikamente und dem Einsatz etablierter Elastografieverfahren bei Patienten mit Virushepatitis heute in den meisten Fällen nur dann eine Biopsie gemacht wird, wenn die Ätiologie unklar ist oder widersprüchliche und unklare klinische Befunde vorliegen. Deshalb kann die Extrapolierung der Grenzwerte von dieser so inhomogenen Population zu Standardpatienten mit viraler Hepatitis in Zukunft problematisch werden und eine bessere Lösung ist nicht in Sicht. Diese Situation mag dazu führen, eine standardisierte validierte Elastografiemethode als Referenz einzuführen, aber dafür muss man sich auf internationaler Ebene einigen. Die sonografische Elastografie, wie sie in herkömmlichen Geräten integriert ist, erlaubt normalerweise die Auswahl der ROI in der Farbsteifigkeitsbox und die Bestätigung bzw. den Ausschluss jeder Einzelmessung für den Endwert. Daher hat der Anwender größere Möglichkeiten die Endbefunde zu beeinflussen als bei FibroScan, bei dem es diese Wahlmöglichkeiten nicht gibt. Daran sollte man denken, wenn man verhindern will, dass der Anwender meist unbeabsichtigt dazu tendiert seine eigene Denkweise über einen bestimmten Patienten oder die Erwartungen des Patienten zu bestätigen. Da die Qualitätskriterien der neuen Technologien, die auf die transienten Elastografie folgten, nicht ausreichend oder (je nach Hersteller) überhaupt nicht definiert wurden, kann die Information, die möglicherweise in einen Bericht einfließt, nicht vom jeweiligen Arzt auf Verlässlichkeit geprüft werden. Schließlich stellt sich die Frage, ob Faktoren wie Transaminasewerte, der Grad der Steatose, das Alter des Patienten, usw. die Endergebnisse beeinflussen und ob sich die Rate der Intra- und Interoperator-Verlässlichkeit, die bei vielen der neuesten Ausstattungen noch nicht publiziert wurde, sich von denjenigen Methoden, die bereits seit mehr als 5 Jahren bestehen, unterscheidet. Daher ist deren tatsächlicher Wert in Hinblick auf die Progression oder Regression der Fibrose bei chronischen Lebererkrankungen noch zu bewerten. 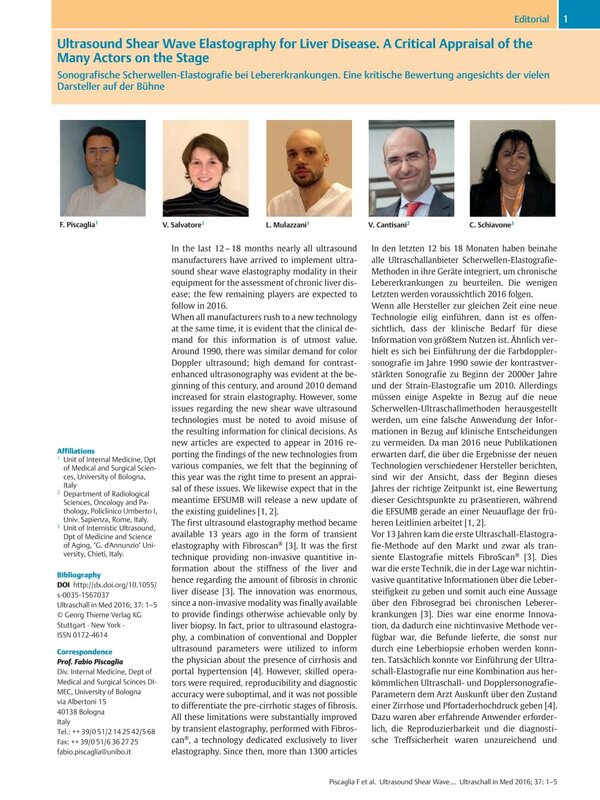 Abschließend ist zu sagen, dass der technologischen Fortschritt bei sonografischen Methoden in der Hepatologie schnell voranschreitet und äußerst spannend ist. Allerdings ist Vorsicht geboten bei der Befundbeurteilung mit den neuesten Scherwellen-Techniken. Noch wichtiger ist, es evidenzbasierte wissenschaftliche Ergebnisse zu erhalten, bevor deren Ergebnisse angewandt werden, um klinische Entscheidungen zu treffen, so z. B. um eine sonografische Verlaufskontrolle bei chronischen Lebererkrankungen, ein endoskopisches Varizenscreening oder eine teure antivirale Therapien einzuleiten oder um eine prognostische Aussage zu treffen. Die verschiedenen Methoden sind nicht unbedingt in Konkurrenz zueinander zu sehen, da diese im selben Patienten durch eine Kombination der verschiedenen elastografischen Methoden eine genauere Diagnosestellung ermöglichen können, als mit der besten Methode allein. Deshalb sind solide Forschungsarbeiten von Einzelzentren, Multizenter-Auswertungen, ein neuer Expertenkonsensus und eine Neuauflage von Richtlinien gerechtfertigt.